The Eight of Cups is often about breaking away from old habits. It's time to shed old lives sometimes in the form of a relationship or other familiar things. Maybe it's time to jump into the unknown and follow a new dream. 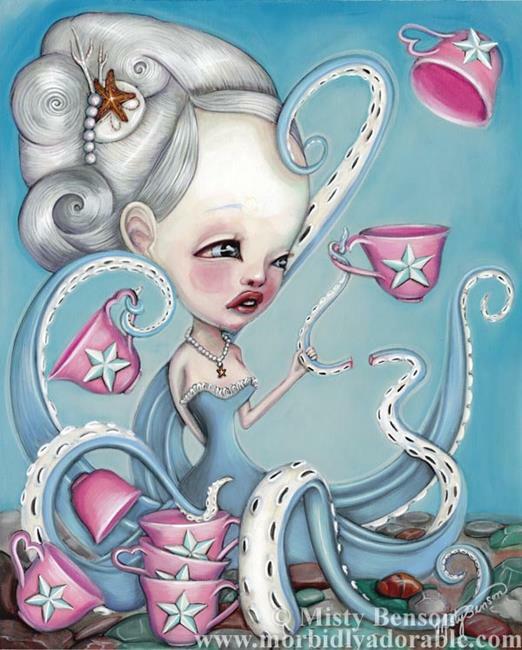 This divine octo-beauty is leaving behind her beloved nautical star tea set. She holds the eighth cup in a tentacle that she has voluntarily broken. Since she is reluctant to let go of that last piece of her past, she is willing to break off one of her own limbs to let go of the past and move toward a new future. As she will regenerate her tentacle once she is on her way, her loss will only be temporary. It's time to follow your destiny and honor the gift of creation! Whether you are a fan of the Morbidly Adorable Tarot, or you just adore this big eye octo-girl, this is full of sweetly spooky symbolism! Visit us at www.morbidlyadorable.com.